We have now received formal permission from the Parish Council (final location for Grove Gardens to be decided) and the various land owners for the boards, and we thank everyone for their help and support. 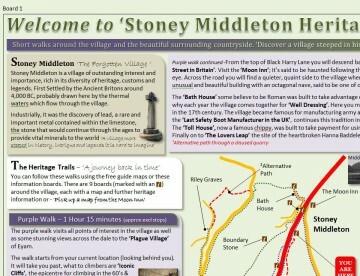 We are particularly excited about the village heritage trail boards which have now been printed, and are at present being fitted out with the framework. We would like to thank Loop Print from Sheffield who have produced the boards, they continue to be very competitive and helpful, and would especially like to thank the proof readers (you know who you are! ), we hope we made all the corrections required. We must also say a big thank you to British Fluorspar LTD who operate from Cavendish Mill for funding the boards and framework. 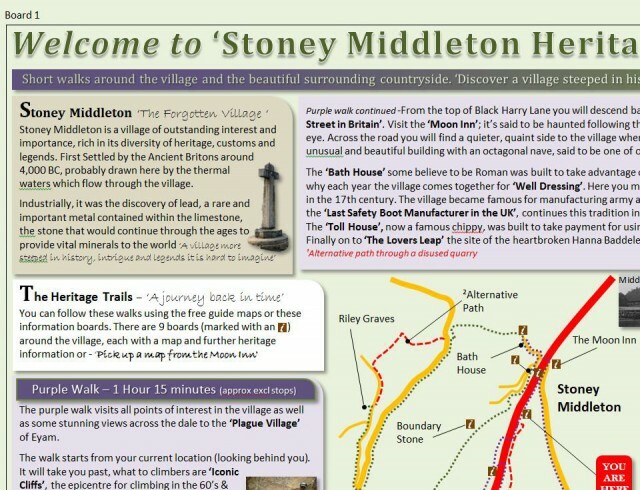 The boards should be in place by the end of the year and we would like to think that everyone will take the opportunity to take the trails, and remind themselves what a diversely heritage rich village Stoney Middleton is.